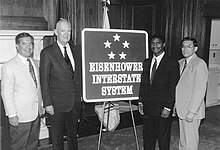 The Dwight D. Eisenhower National System of Interstate and Defense Highways, commonly known as the Interstate Highway System, is a network of controlled-access highways that forms part of the National Highway System in the United States. The system is named for President Dwight D. Eisenhower, who championed its formation. 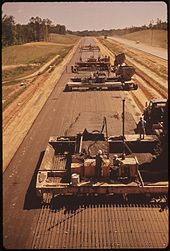 Construction was authorized by the Federal Aid Highway Act of 1956, and the original portion was completed 35 years later, although some urban routes were cancelled and never built. The network has since been extended. In 2016, it had a total length of 48,181 miles (77,540 km). As of 2016 [update], about one-quarter of all vehicle miles driven in the country use the Interstate system. In 2006, the cost of construction was estimated at about $425 billion  (equivalent to $521 billion in 2018 ). The United States government's efforts to construct a national network of highways began on an ad hoc basis with the passage of the Federal Aid Road Act of 1916, which provided for $75 million over a five-year period for matching funds to the states for the construction and improvement of highways. The nation's revenue needs associated with World War I prevented any significant implementation of this policy, which expired in 1921. The Interstate Highway System gained a champion in President Dwight D. Eisenhower, who was influenced by his experiences as a young Army officer crossing the country in the 1919 Army Convoy on the Lincoln Highway, the first road across America. Eisenhower gained an appreciation of the Reichsautobahn system, the first "national" implementation of modern Germany's Autobahn network, as a necessary component of a national defense system while he was serving as Supreme Commander Of Allied Forces in Europe during World War II. He recognized that the proposed system would also provide key ground transport routes for military supplies and troop deployments in case of an emergency or foreign invasion. The publication in 1955 of the General Location of National System of Interstate Highways, informally known as the Yellow Book, mapped out what became the Interstate Highway System. Assisting in the planning was Charles Erwin Wilson, who was still head of General Motors when President Eisenhower selected him as Secretary of Defense in January 1953. 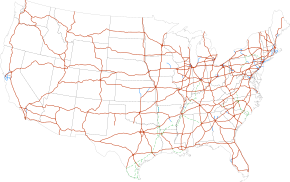 The Interstate Highway System was authorized on June 29, 1956 by the Federal Aid Highway Act of 1956,  popularly known as the National Interstate and Defense Highways Act of 1956. October 14, 1992: The original Interstate Highway System is proclaimed to be complete with the opening of I-70 through Glenwood Canyon in Colorado. This section is considered an engineering marvel with a 12-mile (19 km) span featuring 40 bridges and numerous tunnels and is one of the most expensive rural highways per mile built in the United States. Although this was claimed the final section of Interstate Highway to open, at the time this section was dedicated there were still missing interchanges elsewhere in the system, making some Interstate Highways not contiguous. The system was proclaimed complete in 1992, but two of the original interstates— I-95 and I-70—were not continuous: both of these discontinuities were due to local opposition, which blocked efforts to build the necessary connections to fully complete the system. I-95 was made a continuous freeway in 2018,  and thus I-70 remains the only original interstate with a discontinuity. In 1966, the FHWA designated the entire Interstate Highway System as part of the larger Pan-American Highway System,  and at least two proposed Interstate expansions were initiated to help trade with Canada and Mexico spurred by the North American Free Trade Agreement (NAFTA). Long-term plans for I-69, which currently exists in several separate completed segments (the largest of which are in Indiana and Texas), is to have the highway route extend from Tamaulipas, Mexico to Ontario, Canada. The planned I-11 will then bridge the Interstate gap between Phoenix, Arizona and Las Vegas, Nevada, and thus form part of the CANAMEX Corridor (along with I-19, and portions of I-10 and I-15) between Sonora, Mexico and Alberta, Canada. I-70 in Baltimore was supposed to run from the Baltimore Beltway ( Interstate 695), which surrounds the city to terminate at I-95, the East Coast thoroughfare that runs through Maryland and Baltimore on a diagonal course, northeast to southwest; the connection was cancelled on the mid-1970s due to its routing through Gwynns Falls-Leakin Park, a wilderness urban park reserve following the Gwynns Falls stream through West Baltimore. This included the cancellation of I-170, partially built and in use as U.S. Route 40, and nicknamed the Highway to Nowhere. I-80 in San Francisco was originally planned to travel past the city's Civic Center along the Panhandle Freeway into Golden Gate Park and terminate at the original alignment of I-280/ SR 1. The city canceled this and several other freeways in 1958. Similarly, more than 20 years later, Sacramento canceled plans to upgrade I-80 to Interstate Standards and rerouted the freeway on what was then I-880 that traveled north of Downtown Sacramento. Typically, lower limits are established in Northeastern and coastal states, while higher speed limits are established in inland states west of the Mississippi River. For example, the maximum speed limit is 75 mph (120 km/h) in northern Maine, varies between 50 and 70 mph (80 and 115 km/h)  from southern Maine to New Jersey, and is 50 mph (80 km/h) in New York City and the District of Columbia. Currently, rural speed limits elsewhere generally range from 65 to 80 miles per hour (105 to 130 km/h). Several portions of various highways such as I-10 and I-20 in rural western Texas, I-80 in Nevada between Fernley and Winnemuca (except around Lovelock) and portions of I-15, I-70, I-80, and I-84 in Utah have a speed limit of 80 mph (130 km/h). Other interstate highways in Idaho, Montana, South Dakota and Wyoming also have the same high speed limits. AASHTO policy allows dual numbering to provide continuity between major control points. This is referred to as a concurrency or overlap. For example, I‑75 and I‑85 share the same roadway in Atlanta; this 7.4-mile (11.9 km) section, called the Downtown Connector, is labeled both I‑75 and I‑85. Concurrencies between Interstate and U.S. Route numbers are also allowed in accordance with AASHTO policy, as long as the length of the concurrency is reasonable. In rare instances, two highway designations sharing the same roadway are signed as traveling in opposite directions; one such wrong-way concurrency is found between Wytheville and Fort Chiswell, Virginia, where I‑81 north and I‑77 south are equivalent (with that section of road traveling almost due east), as are I‑81 south and I‑77 north. Auxiliary Interstate Highways are circumferential, radial, or spur highways that principally serve urban areas. These types of Interstate Highways are given three-digit route numbers, which consist of a single digit prefixed to the two-digit number of its parent Interstate Highway. Spur routes deviate from their parent and do not return; these are given an odd first digit. Circumferential and radial loop routes return to the parent, and are given an even first digit. 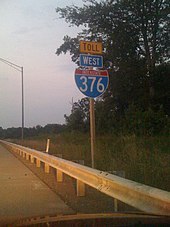 Unlike primary Interstates, three-digit Interstates are signed as either east–west or north–south, depending on the general orientation of the route, without regard to the route number. For instance, I-190 in Massachusetts is labeled north–south, while I-195 in New Jersey is labeled east–west. Some looped Interstate routes use inner–outer directions instead of compass directions, when the use of compass directions would create ambiguity. Due to the large number of these routes, auxiliary route numbers may be repeated in different states along the mainline. Some auxiliary highways do not follow these guidelines, however. The Interstates in Hawaii, all located on the most populous island of Oahu, carry the prefix H. There are three one-digit routes in the state ( H-1, H-2, and H-3) and one auxiliary route ( H-201). These Interstates connect several military and naval bases together, as well as the important cities and towns spread across Oahu, and especially the metropolis of Honolulu. Interstate highways and their rights of way are owned by the state in which they were built. The last federally owned portion of the Interstate System was the Woodrow Wilson Bridge on the Washington Capital Beltway. The new bridge was completed in 2009 and is collectively owned by Virginia and Maryland. Maintenance is generally the responsibility of the state department of transportation. However, there are some segments of Interstate owned and maintained by local authorities. The rest of the costs of these highways are borne by general fund receipts, bond issues, designated property taxes, and other taxes. The federal contribution comes overwhelmingly from motor vehicle and fuel taxes (93.5 percent in 2007), as does about 60 percent of the state contribution. However, any local government contributions are overwhelmingly from sources besides user fees. The portion of the user fees spent on highways themselves covers about 57 percent of their costs, with about one-sixth of the user fees being sent to other programs, including the mass transit systems in large cities. Some large sections of Interstate Highways that were planned or constructed before 1956 are still operated as toll roads. Others have had their construction bonds paid off and they have become toll-free, such as in Connecticut (I‑95), Maryland (I‑95), Virginia (I‑95), and Kentucky (I‑65). As American suburbs have expanded, the costs incurred in maintaining freeway infrastructure have also grown, leaving little in the way of funds for new Interstate construction. This has led to the proliferation of toll roads (turnpikes) as the new method of building limited-access highways in suburban areas. Some Interstates are privately maintained (for example, the VMS company maintains I‑35 in Texas)  to meet rising costs of maintenance and allow state departments of transportation to focus on serving the fastest-growing regions in their states. Over time, the design of the Interstate shield has changed. In 1957 the Interstate shield designed by Texas Highway Department employee Richard Oliver was introduced, the winner of a contest that included 100 entries;   at the time, the shield color was a dark navy blue and only 17 inches (43 cm) wide. The Manual on Uniform Traffic Control Devices (MUTCD) standards revised the shield in the 1961,  1971,  and 1978  editions. Exit numbers correspond to Interstate mileage markers in most states. On I‑19 in Arizona, however, length is measured in kilometers instead of miles because, at the time of construction, a push for the United States to change to a metric system of measurement had gained enough traction that it was mistakenly assumed that all highway measurements would eventually be changed to metric;  proximity to metric-using Mexico may also have been a factor, as I‑19 indirectly connects I‑10 to the Mexican Federal Highway system via surface streets in Nogales. Mileage count increases from west to east on most even-numbered Interstates; on odd-numbered Interstates mileage count increases from south to north. Some highways, including the New York State Thruway, use sequential exit-numbering schemes. Exits on the New York State Thruway count up from Yonkers traveling north, and then west from Albany. Many northeastern states label exit numbers sequentially, regardless of how many miles have passed between exits. States in which Interstate exits are still numbered sequentially are Connecticut, Delaware, Massachusetts, New Hampshire, New York, Rhode Island, and Vermont; as such, five of the main Interstate highways that remain completely within these states ( 87, 88, 89, 91, and 93) have interchanges numbered sequentially along their entire routes. Maine, Pennsylvania, Virginia, Georgia, and Florida followed this system for a number of years, but since converted to mileage-based exit numbers. Georgia renumbered in 2000, while Maine did so in 2004. The Pennsylvania Turnpike uses both mile marker numbers and sequential numbers. Mile marker numbers are used for signage, while sequential numbers are used for numbering interchanges internally. The New Jersey Turnpike, including the portions that are signed as I‑95 and I‑78, also has sequential numbering, but other Interstates within New Jersey use mile markers. Heaviest traveled: 374,000 vehicles per day: I-405 in Los Angeles, California (2008 estimate ). ^ Petroski, Henry (2006). "On the Road". American Scientist. 94 (5): 396–9. doi: 10.1511/2006.61.396. ISSN 0003-0996. ^ Wolshon, Brian (August 2001). ""One-Way-Out": Contraflow Freeway Operation for Hurricane Evacuation" (PDF). National Hazards Review. 2 (3): 105–12. doi: 10.1061/(ASCE)1527-6988(2001)2:3(105). Archived from the original (PDF) on October 6, 2008. Retrieved January 10, 2008. Lichter, Daniel T.; Fuguitt, Glenn V. (December 1980). "Demographic Response to Transportation Innovation: The Case of the Interstate Highway". Social Forces. 59 (2): 492–512. doi: 10.1093/sf/59.2.492. JSTOR 2578033.